At workgroup last week I had to take photos of Alice's egg cups with our egg candles in them. They look so springy and wonderful! The chicken tea cozy was at Gillian's. She had gotten some egg candles from us to surprise her granddaughter when she comes to visit. It reminded me so much of my childhood - chickens are such a great subject. This is the highlight of work group - lunch! We had venison pie that Alice made, beautiful baba ghanoush by Buffy, coleslaw by me and for dessert a berry cake made by Renata. I went to a fish fry at the South Bay United Church back in the fall and after a wonderful meal the cooks in the kitchen were giving away leftovers. I took home a HUGE tub of shredded cabbage. I decided it was time for me to make sauerkraut. First I did some research - I googled it. Then I cleaned the crock that had been the umbrella holder. 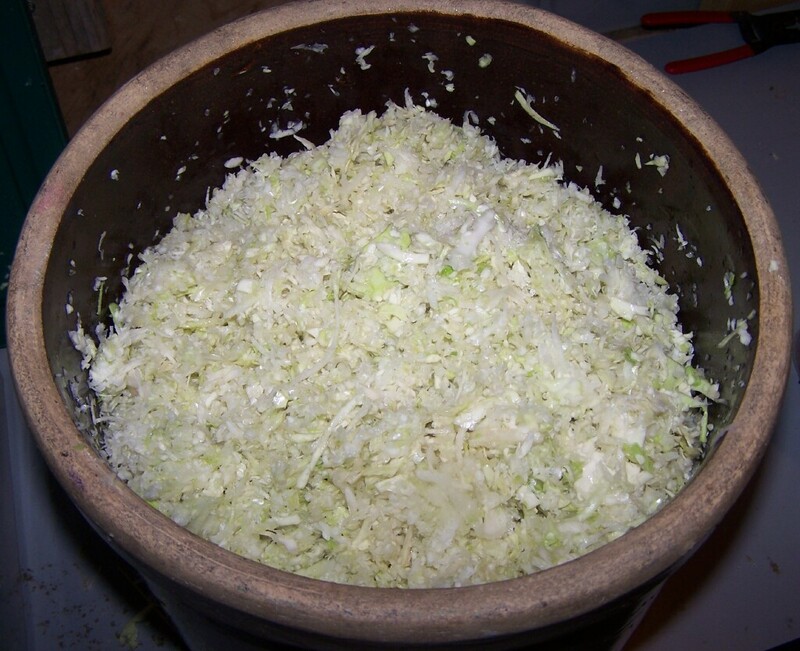 Then I just put in layers of cabbage and handfuls of coarse sea salt until all the cabbage was gone. 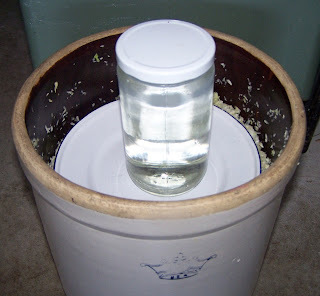 Then I put a plate on top with a jar full of water to act as a weight. After awhile the salt drew the water out of the cabbage and I topped it up with water until the cabbage was covered in water. I left it for about a week and it bubbled away. When mold formed on top I got worried but my research told me to skim if off and wait so I did. Then I packed it all into jars and put them in the fridge and gave a bunch away so I could have other food in my fridge. It tasted amazing and lasted for months. I would definitely do it again and need to as I'm all out of sauerkraut now. Also, check out Coriander Girl. She has an article in House and Home which mentions us! 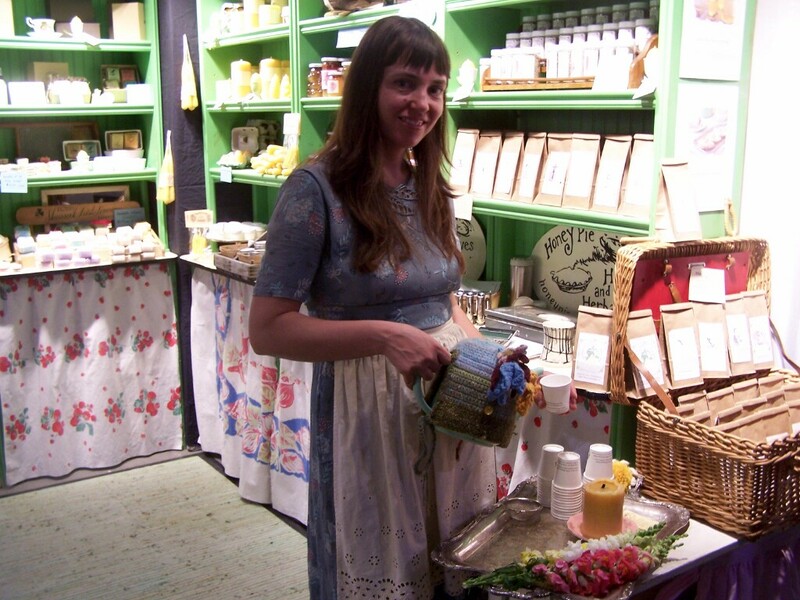 Her flower shop carries Honey Pie products and is so lovely. If you're in Toronto you should go in and see her beautiful shop. Here are some photos from the archives. We've done so many great things with work group. There's the day we made venison sausages at Renata's house. The chicken's were also done at Renata's. We actually didn't kill them but plucked them and cleaned them - and of course ate them - yum! Renanta's husband Tom built a chicken plucker which involves tumbling them over rubber fingers - wow! The rototilling is pregnant Vicki at Buffy's place. I was just reading Chritine Renaud's wonderful blog and I think we should make pita bread at our next work group - but only on a rainy day because we have a lot of gardening to do. I've been meaning to write about my work group for awhile now. It works like this. We are a group of women who meet once a week to work on jobs that are too big to tackle alone. We take turns having everyone over to work for the morning and then have a potluck lunch. There are usually four or five of us so each person gets the group about once a month. We've done mostly gardening but in the winter we paint walls, clean windows, label soap (that's me) and more. These photos are of us making ravioli at Alice's house. We made two kinds - one with spinach and one with squash. Well, we survived the One of a Kind Show. It was five exhausting days long. We brought our farm kitchen to the city and were very well received. 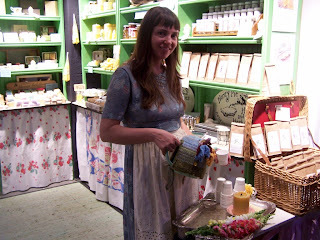 This was the first time we had honey for sale at the One of a Kind Show and it was the most popular thing in the booth. The herbal tea sold pretty well too since we gave out free samples. Lots of people recognized our handmade soap from the Gladstone Hotel and told us how much they loved it. Gavin's using a streetcar conductor's change machine that he bought on ebay. I like how the word 'free' is so big in the photo of Gavin. Everyone likes free samples. Thank you to everyone who helped us out. Special thanks to Nana who looked after our energetic children the whole time. You deserve a medal - perhaps that will be our next craft with the kids. We got a mention here on a fun and styley blog.